Iran has rejected a new US policy offering economic incentives to the Islamic state to give up its nuclear enrichment programme. "No pressure, bribe or threat can make Iran give up its legitimate right" to use nuclear technology for peaceful purposes, said an Iranian spokesman. President George W Bush announced the major change in US policy on Friday. He said the US would back European talks to resolve the stand-off over Iran's nuclear issue. His Secretary of State, Condoleezza Rice, announced the lifting of a decade-long block on Iran's membership of the World Trade Organization, and objections to Tehran obtaining parts for commercial planes. 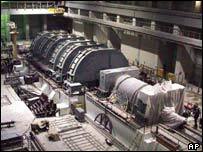 Washington accuses Iran of using its nuclear enrichment programme as a cover for developing nuclear weapons. Iranian foreign ministry spokesman Hamid Reza Asefi told reporters on Saturday that "the remedying of some of the faults and the addressing some of the restrictions that were imposed on the Islamic Republic of Iran without any cause will not prevent Iran from getting its legitimate right" to develop a nuclear energy capability. "The restrictions regarding [aircraft] spare parts that were of no military use should have not been imposed from the beginning, and lifting them is not an incentive," Mr Asefi said. "Getting into the WTO is the right of all countries of the world," he said. Tehran denies seeking nuclear weapons, but has suspended uranium enrichment after negotiations with France, Germany and the UK. The US and European Union want that move made permanent, and have threatened to seek United Nations sanctions if Iran does not comply. There have been suggestions that the US is planning to use military force against Iran's suspected nuclear weapons facilities. If the current negotiations fail, and the issue goes to the Security Council, that would represent a hardening of the European position and would be worrying for Iran, says the BBC's Frances Harrison in Tehran. 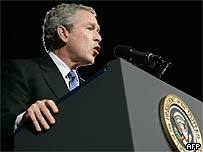 US President George W Bush said on Friday: "I'm pleased that we are speaking with one voice with our European friends. "I look forward to working with our European friends to make it abundantly clear to the Iranian regime that the free world will not tolerate them having a nuclear weapon." "The decision that the president has taken is that the United States will make an effort to actively support the EU3 negotiations with the Iranians," Secretary of State Condoleezza Rice said, referring to talks with Iran led by Britain, France and Germany. Previously, the US had refused to offer incentives to Iran. Tehran has agreed to maintain its enrichment suspension while it negotiates trade and security benefits, but maintains that the enrichment issue is not currently up for discussion.